We have just released the thirty-ninth weekly batch of ringtones and if you are a subscriber they will all be available in your feed by the time you read this as usual. This week the ringtone is titled “Ringtone Blues“ and as you can tell from the title it is a really warm blues tune that will sound when you iPhone ring with this one selected. The instrumental tone this week is – Alert 1 and is intended to be used as the alarm tone in your iPhone. Check this post for details about using the alarm clock in your iPhone. Make sure you right-click the RingtoneFeeder podcast in iTunes and select “Update Podcast” and then click the “GET ALL” button to make sure all the tones are downloaded automatically. Geoff is playing around with the recently released USTREAM app for the iPhone and hosting, what is probably the first, live concert to be watched on the iPhone. See the full recorded show below or search for “geoffsmith” in the Archive on the iPhone app to watch it where ever you are. Following our post about being the most popular podcast in Denmark yesterday we have received messages from several RingtoneFeeder subscribers informing us that we are not just number one in Denmark but also in Greece, Luxembourg, Portugal and Spain. We would like to take this opportunity thank all of you for subscribing and your kind and encouraging feedback. As mentioned yesterday we have just released a few free Griffin Technology ringtones and there just might be more free stuff coming up – so do stay subscribed to the free feed in iTunes even if you are a paying subscriber. If you haven’t already subscribed – you can sign up today starting from $1.98 or try out the free feed in iTunes as mentioned above where you will get a number of free iPhone ringtones including Worldwide hello, One more thing and Alternative Rock. 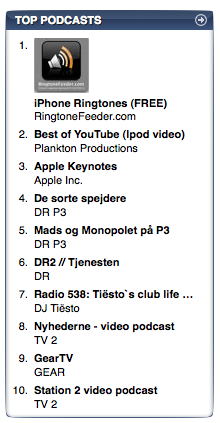 We just noticed that RingtoneFeeder is currently the #1 Podcast in Denmark. Needless to say – we are of course really excited about that and would like to thank all the danish subscribers for your support! We have just released a few free Griffin Technology ringtones and there just might be more free stuff coming up – so do stay subscribed to the free feed in iTunes even if you are a paying subscriber. where you will get a number of free iPhone ringtones including Worldwide hello, One more thing and Alternative Rock. The free Griffin ringtones is a tribute to Griffin Technology as we really love their products so much that we made a few ringtones and a short video for them. Michael Butler Interviews Geoff Smith on Mevio about his jingles and of course RingtoneFeeder – watch the entire interview below and hear a live version of “Ones and 0s” as well as seeing Geoff improvising.